Long Walk was originally built as a wall by the Eyre family in order to construct a mud berth. Among those who lived there around the time this photograph was taken were Tom Gannon, Sarah O’Donnellon, Mrs Hosty, and Pateen Green. There was an entry through a large archway into a courtyard known as Green’s Alley and the five houses there were occupied by the Andersons, McDonaghs, Canavans, Gorhams, and Finnertys. A Mrs McDonagh lived next door in a building known as The Hall and further on lived Mrs Lee, John Folan, Bideen Joyce, Ella McDonagh, Mrs Folan, and Mike Walsh. Hely Dutton, in his survey of County Galway in 1824, wrote: “In every considerable town there is a market for fat cattle and sheep once a week. 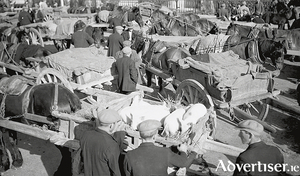 The earliest cattle fairs in Galway were held at Fairhill (hence the name) but in the 19th century, they moved to Eyre Square. It was where the farmer sold his product to other farmers, to butchers and to visiting dealers. 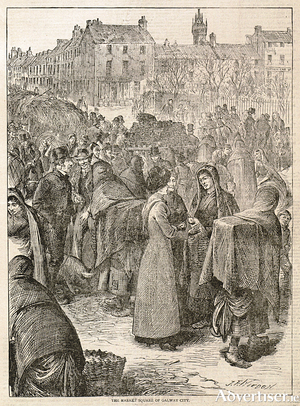 It was where town and country met, where the rural people would come to town to sell, then buy whatever necessities they needed before returning home." 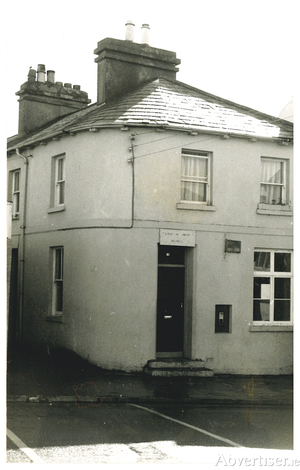 IN 1851, a sub-post office opened in Salthill where the Bal pub is today. 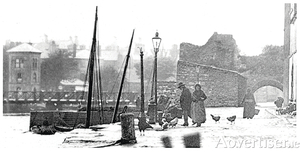 In 1859, Salthill was brought within the town postal area. In those early days the post was delivered on foot. The first bicycle postal delivery was in 1901. From 1914 to 1926, Michael O’Flaherty of Dominick Street and Mike Ruane of Henry Street had a horse and van which they used to deliver letter and parcel post to the Salthill area. The original purpose of the structure that is the Salmon Weir Bridge was to connect the new County Courthouse with the County Gaol on Nuns Island. Urban folklore has it that they built a tunnel under the river at the time in order to transfer prisoners from one building to the other, but why would they construct a crossing over and under the water at the same time? It does not make sense. 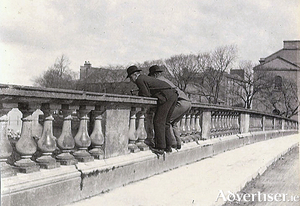 The building of the seven span bridge started in 1818 and finished in 1819. 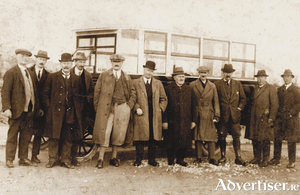 The first regular public transport service in Galway was run by the Galway and Salthill Tramway Company which started business on October 1, 1879, and by 1885 was being used by in excess of 105,000 passengers per year. During World War I, most of the company’s best horses were commandeered by the British Army and there was more and more competition from motorised vehicles, so the tramway ceased trading in April 1918. 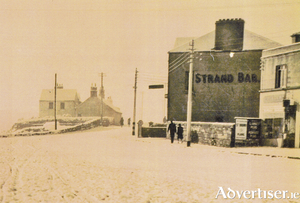 This wintry photograph of part of Salthill was probably taken during the war as there are no vehicle tracks in the snow, indeed there are no vehicles to be seen. 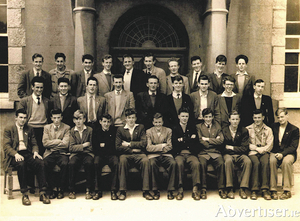 The shop on the right was built by a Miss Burke who came here from Castlerea in 1935. 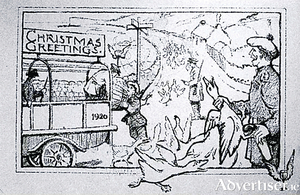 It was a grocery and sweet shop with advertisements on the wall outside for plug tobacco. 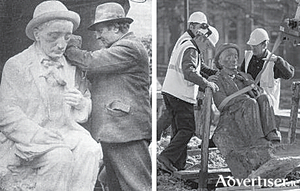 Even before it came to Galway the statue of Sean Pádraic Ó Conaire was causing a stir. As Albert Power carved away in his stone-yard at Berkeley Street, Dublin, word had got out that this was a work of exceptional standards. We came across this drawing in the National Library titled “A narrow street in Galway, c.1840-1850”. The clue is in the handwriting at the top of the image, ‘Castle Bank’. 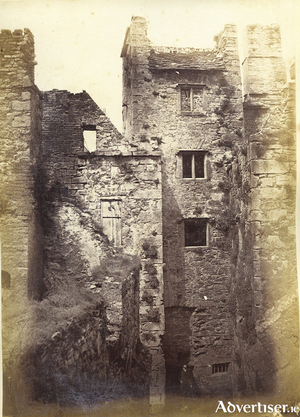 In fact, it was a courtyard, not a street, looking at the back of Banks Castle off High Street. Our photograph (courtesy of the Chetham Library in Manchester), shows us much the same view about 25 years later. The property is now part of the King’s Head. “This fine building, which is superior to most provincial seats of justice, stands at Newtown-Smith, on the site of the ancient and venerable abbey of the Franciscans, which by the Charter of Charles II ‘is to be and remain part of the County of Galway forever’. 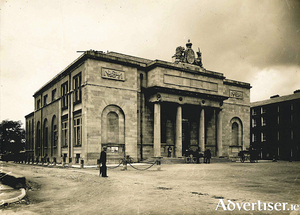 It was commenced in 1812, and on 1st of April, 1815, was opened for the reception of the then going judges of assize. The Citie of the Tribes was the name given to the first steamboat to sail on the bay. 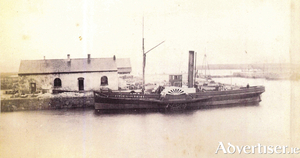 She was built in South Shields and registered on December 24, 1872, for the pioneering Galway Steamboat Company and her arrival here was hailed as the precursor of the new shipping millennium, the era of steam. In 1883, Thomas Parry, a 26-year-old assistant shepherd, was working for Major Thomas Braddell in Wexford. 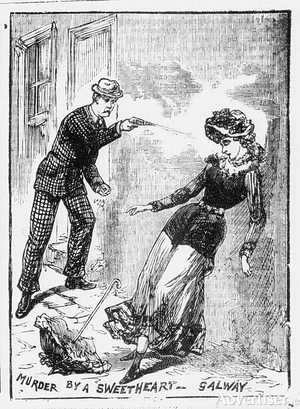 Also working there was Alice Burns, a 19-year-old Galway girl. The two had a whirlwind romance, Parry was deeply in love and bought her a beautiful ring and they became engaged. 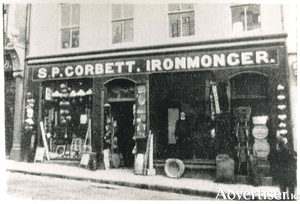 SP Corbett, ironmonger (known as Sam), opened a hardware shop for business in a premises on Williamsgate Street in 1894. It was a one-stop shop where one could get lost with the extraordinary array of goods, even those on display on the footpath. Inside, one could buy spade trees, ropes, churns, seed potatoes, Fenton’s cutlery, washing boards, kitchen chairs, oil lamps, fowling pieces, portmanteaus, non-poisonous sheep dips, perambulators, mail cars, threshing machines, wallpaper, glass and earthenware, oil paints in colours of every description, Persse’s whiskies, brass and iron bedsteads, hair, fibre and spring mattresses, linoleums, bamboo and wicker goods, guns and ammunition, wallpaper, mowers, reapers and binders, and everything a fisherman might need. 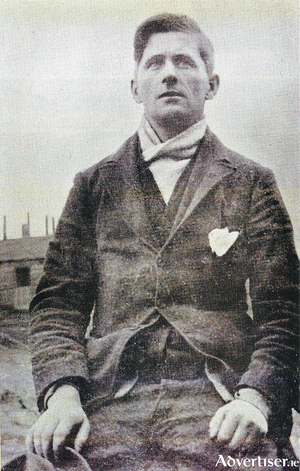 Liam Ó Briain was born in Dublin in 1888. In 1916 he helped print the Proclamation and he served with Michael Mallin in the College of Surgeons during the Rising. He was subsequently interned in Wandsworth Prison and in Frongoch. In 1917 he was appointed professor of romance languages in UCG. He was jailed in Belfast in 1919/20. 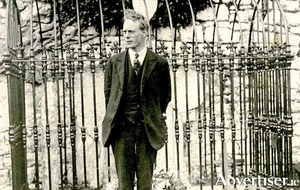 When he returned to Galway he was appointed as a judge in the Republican Courts In late 1920, he was having dinner in college when he was arrested by the Black and Tans, and jailed for 13 months in Galway and the Curragh. Some of his experiences in prison are vividly described in a recently published book. As the War of Independence hotted up, the British authorities sent the Black and Tans and the Auxiliaries to Ireland to support the RIC. 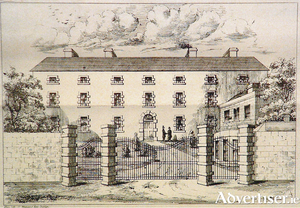 D Company of the Auxiliaries was stationed at Lenaboy Castle and at The Retreat in Rockbarton. The area we know as Devon Park in Salthill was originally part of the Lenaboy estate which belonged to the O’Hara family, who were based in Lenaboy Castle. 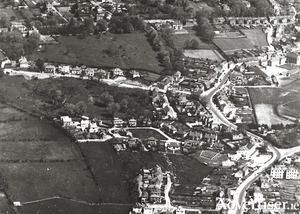 The entire left hand side of our aerial photograph (c1940) was part of the estate, originally a green field site, the outer wall of which ran along the main Salthill Road. Bertie Simmons knocked part of that wall in the early 1930s and built two houses, one at the corner (where the fish shop is today) and one behind it where Hartigans lived. In the UK general election of 1918 Irish men, and for the first time, Irish women, struck a major blow for Ireland's right to self-determination, by electing 73 Sinn Féin MPs - almost 70 per cent of the vote.